The first-ever Sunday Times journalism apprentice has started training with News Associates – the UK’s number one NCTJ journalism school. 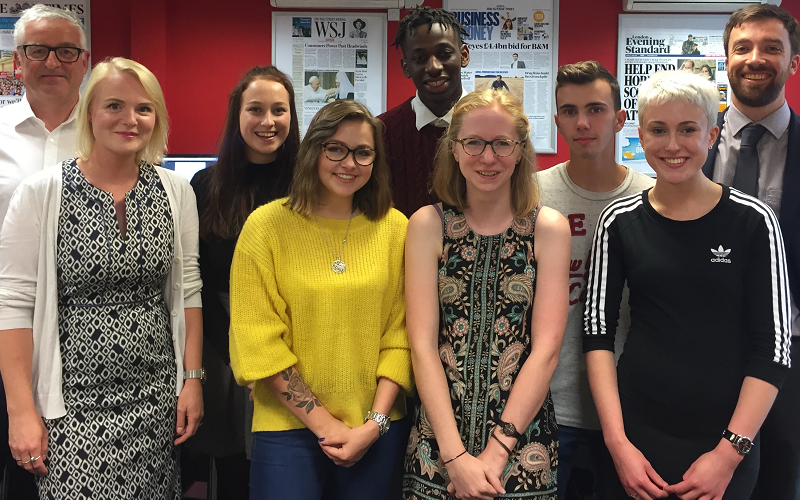 News UK are again partnering with us, with five apprentices from The Sun and one from The Sunday Times. The apprentices will combine their Diploma in Journalism studies, with a day a week on placement. They will then start full-time contracts, working across a range of news, features and digital roles, in late January. Danny De Vaal, Thea Jacobs, Jessica Lester, Bonnie McLaren and Danielle O’Brien are the second intake of News Associates apprentices supported by The Sun, with Shingi Mararike sponsored by The Sunday Times. Shingi said: “A job at my favourite newspaper alongside a training programme at News Associates is an amazing opportunity. Bonnie said: “I’m so delighted to be on The Sun’s apprentice scheme and to learn on the job with News Associates. “It’s always been my dream to be a showbiz reporter, so I can’t believe I’ll be working on Bizarre. Meanwhile, former Sun managing editor Graham Dudman has joined News Associates as deputy managing editor. Rachel Bull is promoted to course director with responsibility for all the agency’s training programmes in London and Manchester, with Graham Moody succeeding her as head of journalism in London. Dudman said: “I am delighted to have joined News Associates. It’s an incredibly professional operation and it will be exciting to be part of a fantastic team. Robert Hands, executive managing editor of The Sunday Times, said: “Shingi is one of the most enthusiastic and energetic people I’ve come across in journalism and when he did work experience with us last year, he impressed a number of senior executives with his overwhelming passion for journalism. Richard Barun, deputy managing editor of The Sun, said: “Graham has been instrumental in developing the programme through which The Sun has recruited eight high calibre apprentices. How my NCTJ journalism training prepared me for covering the Grenfell Tower fire	Weekly news quiz: Can you beat our journalism trainees?